The S.A.P. brand stands for "Strumenti Acustici di Precisione" (Precision Acoustic Instruments - which in Italian stands also for Strumentation, n.d.t. ), a company based in Salerno, about which you can have more information by reading the interview given to TNT-Audio by its owner, Mr. Vincenzo Fratello (if you haven't already done it, I suggest you first read it, in order to see the philosophical elements upon which S.A.P. 's production is based, and to better understand and value the results of this review). 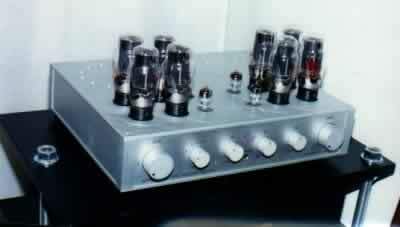 I am going to review an evidently artigianally produced object - the tube integrated amplifier "Anniversary", featuring, as we'll see, a rather singular design and realization. The Anniversary is an OTL integrated amplifier, a completely dual mono design, sporting a single-ended configuration. The data measured on the d.u.t. were a power of 19 w/4 Ohm/ch., raising up to 26 W/8 Ohm and to 34 W/16 Ohm (being an OTL design, its output power increases with load impedance). Dynamic headroom measures 4.8dB (with a 100-millisecond signal burst), and the slew rate is 77V/microsecond. The frequency response related to its nominal power goes from 12 through 500.000 Hz, and S/N ratio is 94 dB (input 500 mV, maximum power). The valves it uses are four selected 6922 Philips JAN and eight 6AS7G, custom (to S.A.P. 's specs) superselected directly by the provider. The machine presents a stabilization circuit that allows, once the bias is adjusted, the balance and the automatic optimization of the working point of all the final tubes, and to maintain it until they finally wear out. The Anniversary sports a totally zero-feedback final stage; the power source is provided by two 400 VA transformers. It's worth noting that the amplifier, developing on three stages, inverts its output, thus the speakers must be wired "counter-phased". The Anniversary's controls consist of, on the front, the on/off switch, a switch to mute the loudspeaker, the volume knob (doubled for each channel), the input selector, the tape monitor switch, and a headphones socket. On the back panel, we can see the power output binding posts, an IEC AC input socket, three unbalanced RCA sockets for high level inputs, and an output to feed power to a phono unit. The Anniversary's listening test was a hard task. Although these days I can count on three different - either for their realization and their sound - pairs of loudspeakers, with each I distinctly felt they were holding the amp back. Since I wanted to be sure to give the amplifier the best chance I could to let it express at its best, we asked for a pair of S.A.P. loudpeakers and very kind company's owner, Mr. Vincenzo Fratello, satisfied our request by sending us a pair of S.A.P. Trio loudspeakers. 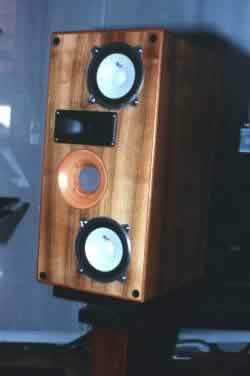 The Trios are mid-sized bookshelf boxes, medium-high efficiency (92db), sporting five drivers: a horn-loaded piezoelectric supertweeter (devoted, in company's thoughts, to reproduce most of the ambience signal), a 5-cm paper tweeter, also loaded with a wooden "Tractrix" horn, two circa 13-cm full-range self-produced drivers with Alnico magnet and "Comtex" (something derived from polypropylene) membrane, and, for the lower frequencies, a passive driver placed on the rear panel. All active drivers are extremely light and fast. They are sold in selected and matched pairs, thus warranting the highest performance possible. Where necessary, a crossover with only precious oil-and-paper capacitors is used, and it must be noted that the crossover does not work in the mid frequencies, as - according to the producer - a cleaner, more coherent and natural midrange is the result. The cabinet is made of betulla multi-layer wood, aged for at least three years, measures 26x52x32 cm. (WxHxD), and weights 8 Kg. The connectors for the cables are made of solid copper, and there's another connector placed slightly under them, which is used to ground the drivers' baskets. The impedance is 8 ohm, and the maximum recommended input power is 50W RMS. They are hand made, and the price is lit. 7.850.000 (Euro 4.055) the pair. This particular kind of loudpeakers is, usually, the best to couple with modestly powered valve amplifiers, and the Trios, in fact, were designed to be an optimum match with the Anniversary. I'll do the listening test keeping in mind this factor, giving separate judgements depending on the loudspeakers used. The bass is powerful and extended, with good energy down to, at least, 40 Hz, threshold below which the results have a less "imperious" feeling. The mid-low is good, never too much in evidence, and the midrange is very beautiful, sweet and liquid, even though rather laid back, with no particular presence. The mid-high is good, which hardens a little when driven hard. The top-end is accurate and refined - I would have prefered a little more "body". With the SAP Trio 'speakers. When matched to the Trios, the feelings of both laid-back mids and hard mid-highs just disappear, but there is a slight colouration, probably due to the horn loading of the tweeter and super tweeter. However, it's something very far from the coloration induced by some other horned loudspeakers I happened to listen to in the past, and not annoying at all. The feeling of a natural presentation also increases, which gives the reproduction a touch of fascination, although I personally would have liked a more forward mid-high range. Yet, if you pump up the volume, the benefits of the coupling with the Trios are compromised, the sound hardens and loose those peculiarities that make it particularly interesting. Maybe, someone who has a large room and wants the Anniversary, should match it with speakers different than the Trios. The results vary a lot, depending on the speakers. Matched to a pair of loudspeakers with a low impedence, the Anniversary became too slow in the dynamic jumps (I felt it had poor control of the woofers), with a low range a little boomy and loose, also slow compared to the higher range. 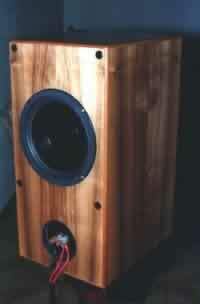 Matched to several loudspeakers, with an easier electric load (essentially nominal 8-Ohm two-way bookselves), of different quality, design, and realization, the amplifier expressed itself much better well up to its class - In particular, matched to a pair of bookself loudspeakers with a minimalist cross-over (unfiltered woofer and a 6-db high pass), I can report a significant improvement in control, speed and dynamics. With the Trios, dynamics and micro-contrast cannot be criticized, and it almost sounds like a different piece of gear (! ), with great speed. Yet, even in this configuration it's best to keep the volume down (I'd like to test the Anniversary with a pair of bigger and more efficient loudspeakers, but I don't want to abuse Vincenzo's kindness... :-). The image is up to good level, with a good depth and height scan, but with limited width. It Doesn't give pin-point imagery, more of a sound picture with instruments never standing alone. This can't allow you, for instance, to accurately follow the spatial movements of Ellis Marsalis' (Ellis Marsalis Trio - Blue Note - Track 1) piano keyboard virtuosity; however it's pleasant, and doesn't limit your 'suspension of belief. With the Trios, It was completely different, the scene width literally explodes. Image focus and definition notably increase, with more air between the players, and allowed me to "read" the reproduction of musical instruments. The amplifier wasn't properly "universal", it's idiosyncratic with some partners (substantially, loudspeakers), thus limiting your choice. Although a dual-mono design, I would have appreciated the provision of a single volume knob, instead of the two rather fussy controls. The binding posts are rather small, hard to handle and to tighten especially with spade-terminated cables. No problem with bananas (or the specific alternative connecters provided). A particular piece of gear for particular users. It needs to be matched great care, only then is it able to express itself in an extremly interesting musical way. The potential buyer of the Anniversary will have to accept this fact: whoever buys this amplifier, is going to have to 'buy' a philosophy (valid at least as much as the other ones), and if he/she wants to obtain the results that philosphy is able to ensure, he/she must completely follow it, matching together components that obtain the best synergy. When building up a synergic and good sounding system, every choice will have to rotate around this S.A.P.-branded OTL's requirements. A warm and heart-felt thanks goes to Mr.Vincenzo Fratello who lent us the amplifier for this test, and (above all) for having stoically supported (and bared! :-) my tricky needs to obtain the best from the Anniversary during this listening test.